Happy Valentine's Day! 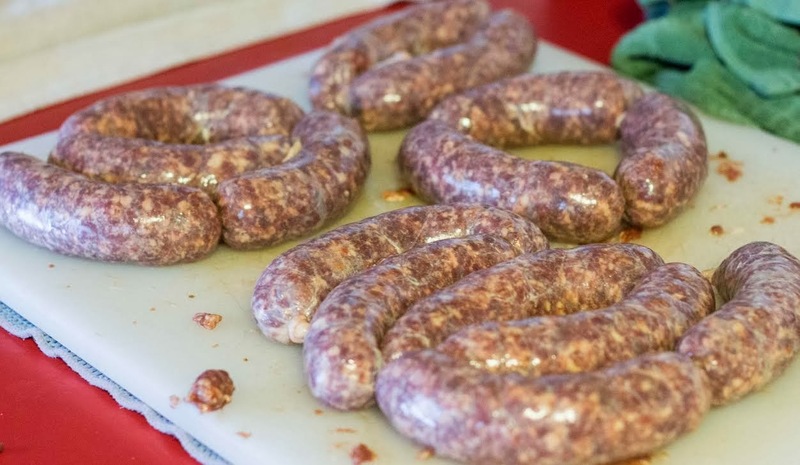 Making a sausage with pork hearts has been a goal of mine for a while, especially after reading the recipes for heart burgers and heart tartare in Jennifer McLagan's book, Odd Bits. The heart is a lean, hardworking muscle, and a piece of offal I call on in attempts to bring offal to the unconverted. It's not too different from skeletal muscle, so it doesn't seem like a hard culinary jump to make, unlike tripe or lungs. 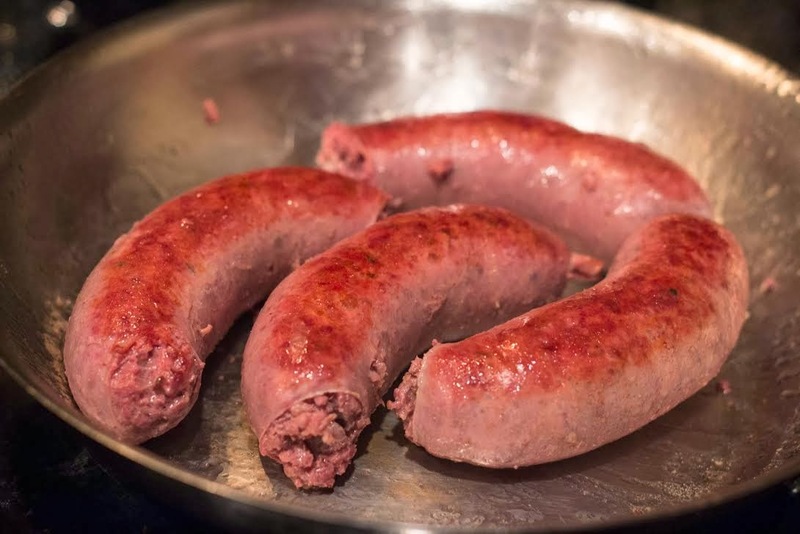 For this recipe, I used three pig hearts (one Tamworth, and two Gloucester Old Spot/Tamworth crosses), which made up 60% of the sausage filling. The other 40% was fatty ground Tamworth pork. This was pretty fatty to start with, so I didn't add any additional back fat. Hearts remind me of a rabbit warren - they're full of tunnels, passages, and dead ends. The easiest way to deal with them is to slice them open and spread them out flat, like unrolling a bell pepper. There's some good meat in the middle, but just cut that out for now. This will give you a nice, flat piece of meat to work with. Once the heart is spread out, trim off all the ventricles and valves at the top, which will feel like hard rubber rings. I usually rinse the heart as well, since blood like to hide in the nooks. Next, return to that middle bit you cut out and trim off any hard or bloody bits. This will leave you with nice lean meat you can use in a lot of recipes, such as kabobs, grilling like flank steak, or grinding. Normally I braise hearts for a looooong time, or quickly grill them. Since this sausage would be in the middle of the cooking spectrum, I ground the hearts twice, using the smallest diameter on my cutting plate for the final grind. My goal was to break down and tenderize the hearts as much as possible. For seasoning, I just used garlic, caraway, black pepper, and thyme. I was curious how the flavor of the hearts would come through, so I went very light on spicing. When it came to the eating, I was pleased with the sausage, but you could tell there was something peculiar about them. The meat didn't quite stick together as I thought it would, even after kneading it to develop the binding myosin proteins. After frying in a pay, it was still a bit loose, and had a slightly "sticky" finish. Matt gave me a great book on Polish sausages, and I was surprised there were no recipes for heart sausage. They're used in head cheese, and some liver puddings, but no sausage. 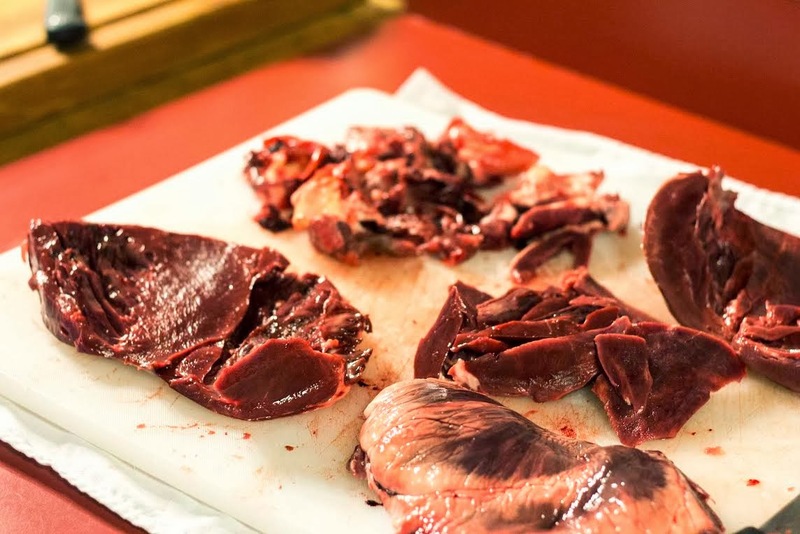 I wonder if it's just because the hearts, which are made of cardiac muscle, don't lend themselves well to this type of dish, at least in the high percentage of heart meat I used. Or perhaps since head cheese has so many gelatin-rich ingredients in it already, it makes up for the heart's lack of binding. No photoshop! These heart sausages turned super pink while cooking. But honestly, these are small qualms, and just about the texture. Flavor-wise, I really liked these sausages and the garlic and caraway really went well. I don't use caraway often in sausages, but I'd be curious to try it again, in a bit higher quantity. Will I make a 60% heart sausage again? I'm not sure. I'd definitely add a heart to a sausage recipe, but I'd shy away from using as much as I did in the future.